As I’ve mentioned before, Panama is in the rainy season, so the images I had in my head of endless white sand beaches with a view of nothing but palm trees and water are far from my reality. A constant gray sky with a humid mist is what I experience most of the time, along with sporadic downpours of rain. 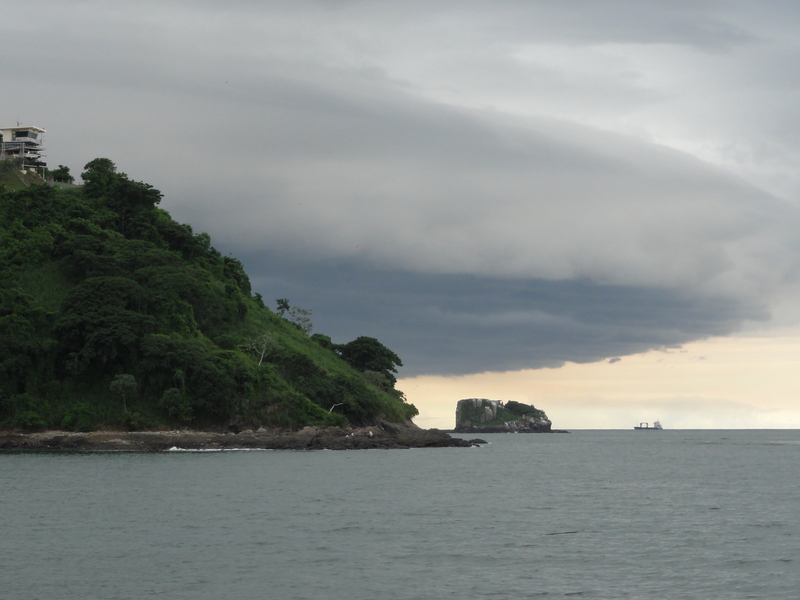 Actually, even though “downpour” seems to be the most intense classification of rain, it doesn’t even come close to describing the daily tropical storms in Panama. Calling the water I like to refer to as “Floods from Above” simply as rain is rather like saying “It was a little windy yesterday” if a Tornado ripped through your neighborhood consuming everything in its path. Not only is the sheer volume and speed of the rain the most intense I’ve ever seen, but there is little if any warning that everything you own will look as if you dove into a pool within seconds. Another Panamanian fun fact that I failed to take into account was that there are no beaches in Panama City, despite being right on the water. A combination of poorly planned sewage disposal directly into the ocean combined with an enormous volume of massive ships passing next to the city to the canal on an endless basis, the water is far too polluted for anyone besides the blindly intoxicated. 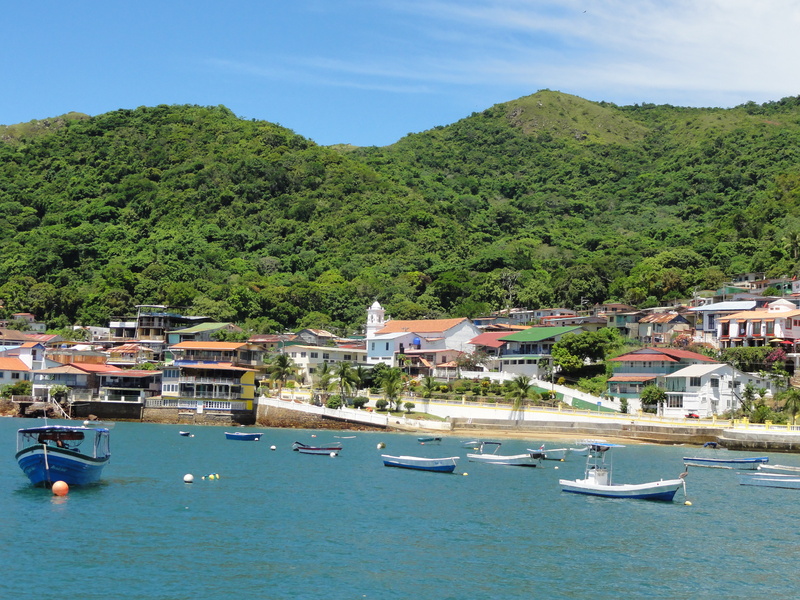 The closest beach to the city is actually on an island which is one hour from the city by ferry called Isla Taboga. I’d heard the beach was only “okay” from some locals, but coming from the landlocked mountain state of Colorado any beach to me is pretty awesome! Clearly it was my destiny to escape the hustle and bustle of the city and go to the beach because the morning I intended to go the clouds had disappeared and been replaced with a beautiful, blue sunny day. So excited to swim in the Pacific for my first time in Panama I neglected to bring a towel and grabbed a taxi to the port. As people began to line up for the ship I hung out underneath a tree to avoid the intense rays of tropical sunshine. Eventually I made my way onto the ship, lathered up in some protective lotion as I have pathetic sun resistance due to my English heritage, and found a place to stand on the front deck. 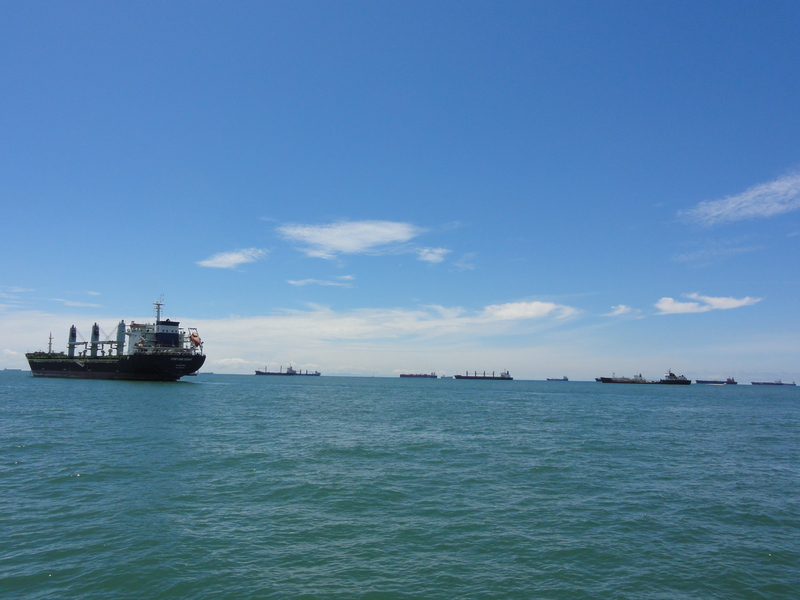 As we approached the island the scenery was absolutely unreal due to the enormous number of huge tankers dotting the horizon, awaiting entrance into the canal. I imagined this is what it would look like during a massive naval invasion if all the cargo and tankers were battleships! With the sea breeze masking the intensity of the sun the boat eventually made it to a picturesque little island civilization. One look at the island made me realize the potential awesomeness of beaches here in Panama. If the locals think this island is only mediocre then I can’t even imagine what they consider a great beach because this place was perfect. A quaint little colorful island town, it’s one of those spots that make you think “do people really live here!” It seems like Hammock Chillin’ and Fishin’ make up 95% of the activities on the island and after a brief walk around that made me feel like I went swimming due to the crazy amount of sweat being excreted from my body I decided it was ocean time. With sunscreen infused sweat dripping into my eyes I did a brief walkabout along the beach in search of a hot Latin babe to help lather some sunscreen on my back and watch my backpack while I went swimming. Not really seeing any babes who looked like they spoke much English and already feeling burns starting on my back I proceeded to put sunscreen on the front of my hands and do my little “Sunscreen Dance” desperately trying to contort my arms into unreasonable positions to effectively lather my entire back. This is especially hard when I was so unbelievably sweaty the sunscreen had zero chance of absorbing and did I mention I forgot a towel? Eventually satisfied by my efforts I found some other Americans on the beach to hangout with and drink some cheap cervezas in the sun. They agreed to watch my bag and I immediately jogged to the water and just swam straight towards another island with the excitement of an 8-year old the eve of their first trip to Disneyland. Having been in the unbelievably humid city for about a week you can imagine I had been building up this moment in my head for some time, and it was everything I could imagine for the first 2 minutes, then my dreams were shattered…. An intense burning and stinging feeling started around my elbows and raced all up and down my arms and back. For a split second I thought I had been stung by some crazy tropical jellyfish so I immediately started frantically swimming back to the shore in hope that I could reach a depth I could stand before I went into shock!! Thinking more rationally and having experienced something similar to this before in the oceans of Thailand I realized it was merely a case of sea lice, which wasn’t a huge deal, but completely ruined my moment and caused little bite marks all over my body. Being super angry with the ocean I decided to purchase some more ice cold cervezas and hang with my newfound American pals until the journey home. This entry was posted in Panama and tagged Adventure, Panama, Panama Beaches, Panama City, Sunburn, Taboga, Travel, Tropical Rain by verenico. Bookmark the permalink. And what a rainy season it can be. 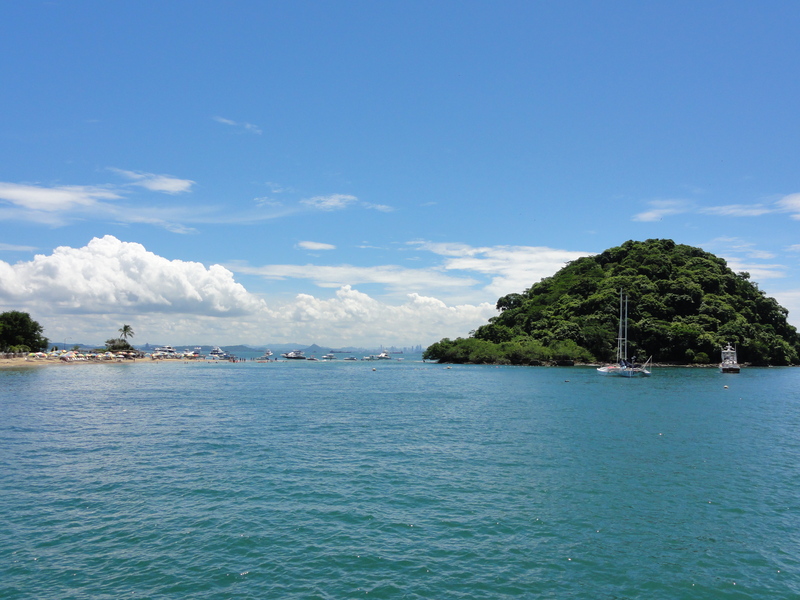 But it adds to the charm of life isla de panama.